It seems part of our age that all human experience can be reduced to a league table, so I’m proposing a thought-experiment. How about a list of favourite European landscapes? I wouldn’t like to second-guess all the candidates for top slot, but I’ll suggest my own choice. I’ve visited the dehesas of Extremadura in south-western Spain and eastern Portugal about 15 times, but a recent trip was the first occasion I’d seen it in late winter. Even without those astonishing carpets of wild flowers that are such a feature of the spring, the landscape seemed as full of vibrant beauty – and birds – as on every other trip. If you’ve never seen Extremadura’s dehesa then you still have one of the great moments of your life before you. When I first set eyes on it almost exactly 35 years ago to the day I was mesmerised not just by the flowing contours of the plains but also the mathematical precision with which unseen Spanish hands had spaced out an endless ‘forest’ of evergreen oaks. Each individual tree is laid out in identical manner. The top is reduced to four main branches spreading to the four points of the compass. The sum effect of the regime is that every tree looks like a green umbrella. Replicate it a million times and you have a sense of one of Europe’s ultimate wildlife landscapes. One intriguing sidelight on dehesa is the trouble we have in classifying exactly what kind of landscape it is. It’s often thought of as a type of park woodland but just as often it is treated as savanna or steppe ‘with trees’. These taxonomic difficulties may well reflect our modern concern that landscapes should be a single entity rather than two, or even three simultaneously. What is indisputable is dehesa’s extraordinary richness for birds. At any one moment almost anywhere in Extremadura the sky is full of raptors. Hundreds of birds of at least ten species are barely even noteworthy. In fact there are often so many vultures over what can seem like acacia savanna that it feels more like tropical Africa than temperate Europe. What makes dehesa so deeply fulfilling is not the rarities, marvellous those these are, it is the commonplace birds and their sheer abundance. Features that we have forgotten or lost from Britain, such as massive flocks of sparrows and larks, are still embedded in this glorious farmland. One moment during the last visit that gave me huge pleasure was a stop by a feedlot. There was a dense, endlessly recycling mixed flock of Spotless Starlings, Corn Buntings, sparrows, larks and finches. It fizzed with ordinary life and therein lay the joy of it. Yet what seals dehesa as the ultimate habitat is that this is not some carefully preserved national park barricaded behind a fortress of acronyms and official designations. It’s a working landscape and as devoted to human products as the worst arable monoculture. In fact, dehesa yields six principal harvests. It is cattle or sheep pasture as well as cropland and a source of charcoal or firewood. Its key speciality results from those billions of acorns, which fatten the region’s breed of black pigs. It is their exquisite hams and smoked meats that are savoured by all Iberian people. Finally the cork oaks produce that bottle stopper which makes the wonderful sound when the bottle of Spanish Rioja is first opened. 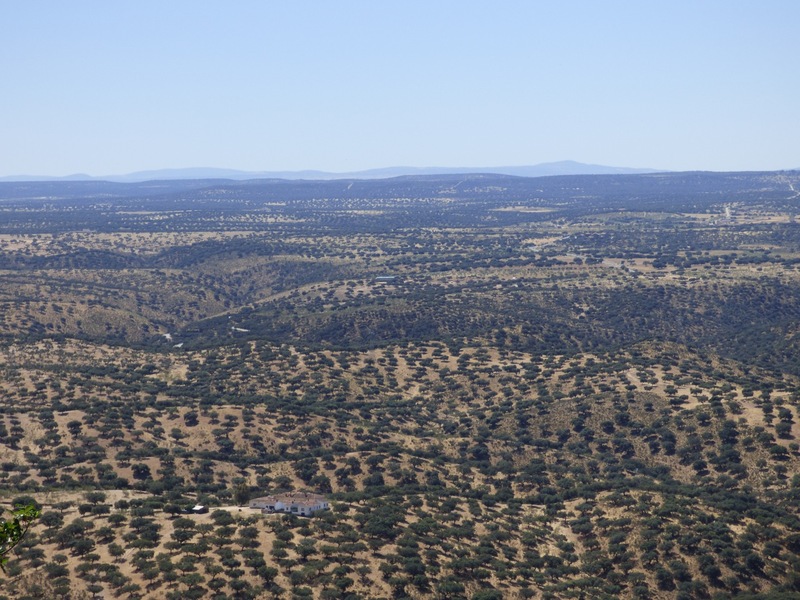 Dehesa is more than a bird- habitat. It is a hope-filled model of what human land-use can be: a gloriously creative transaction between ourselves and nature. Next year I am, together with Martin and Claudia Kelsey of the lovely Casa Rural el Recuerdo (near Trujillo), running a week-long nature and writing course from Sunday 31 January – Saturday 6 February 2016. It promises to be very special. At last I can be involved in a course where we can not only talk about nature but can be in daily contact with some of the most extraordinary wildlife in Europe. Among the things we will look for are the huge flocks on Common Cranes (pictured below) that pass the winter in Extremadura’s rice fields. There’s more about the course under the Talks and Teaching section of my website. I hope to see you.